Dara Pelkey-Field (Class of ‘02) does not simply back down from a challenge. Her determination and believe-that-you-can attitude has landed her a career that she loves and the title of top female triathlete in Nova Scotia. Despite these notable accomplishments, both journeys certainly gave Dara a run for her money. Growing up in Fredericton, New Brunswick, Dara moved to Truro to attend Dalhousie University Faculty of Agriculture (then known as the Nova Scotia Agricultural College). Despite advice from a high school guidance counsellor discouraging her from pursuing a science based program, Dara earned her Bachelor of Science degree majoring in animal science. She then went on to complete a Master’s of Science degree from the University of Edinburgh in Scotland. Dara now works as an instructor in the Department of Animal Science and Aquaculture at the Faculty of Agriculture. She is also the manager of the equine facility on campus. She currently instructs courses in general equine biology, equine genetics, reproduction and facility management, and is the lab instructor for an equine fitness and health course. Dara’s success in her career is matched by her personal success in athletics. Always involved in sports, Dara’s determination to succeed has made her a successful equestrian and triathlete. Growing up, horses and show jumping have always been her main focus, with some volleyball and field hockey thrown into the mix. About seven years ago, Dara began running competitively. Looking for more of a challenge, Dara took up biking and began competing in duathlon, a competition that combines running and biking. In 2015, Dara and her husband, Mike, qualified and competed in the World Duathlon Championships held in Adelaide, Australia. With her success competing in duathlons, Dara was still hungry for more. Running and biking came naturally to Dara but she had a phobia of water holding her back from competing in triathlons. Competing in swimming was out of the question- until recently. After countless hours in lakes and pools with the help of Mike and some great friends, Dara’s fear of the water slowly evaporated. Dara follows a rigorous training schedule to ensure she stays in tip-top shape for all sports she is currently involved in. While triathlon certainly holds a place in her heart, its show jumping that is her true passion and really gets her blood pumping. During the off-season, Dara trains with her horse, Ava, four to five days a week. During peak show season, her training is increased to six days a week and competitions nearly every weekend. In addition to her equestrian training, Dara trains just as hard with Mike and some of their friends for triathlon. Dara’s hard work has certainly paid off. This year, she competed in 10 triathlon races, eight of which were Triathlon Nova Scotia point’s series races. By racing at Triathlon Nova Scotia sanctioned events, participants earn points which, based on their top five races, are tabulated as a season score. Dara finished this season as the top female triathlete in Nova Scotia, a feat she would have not imagined a year and a half ago. 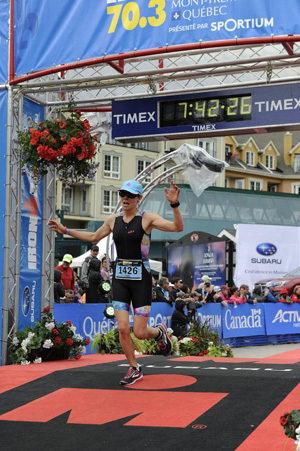 For Dara, it’s the mental component that has made her a successful triathlete. While she admits that the sport tested her as much mentally as it did physically, she believed that she could do it and she did. She preaches this advice to anyone looking to achieve a personal goal.